Fra Bartolomeo (1472–1517), The Rest on the Flight into Egypt with St. John the Baptist (c 1509), oil on panel, 129.5 x 106.7 cm, J. Paul Getty Museum, Los Angeles, CA. Wikimedia Commons. If you were asked to name the four most important artists of the Italian High Renaissance (1495-1527), the first three would come quite easily to many: Leonardo da Vinci, Michelangelo, and Raphael. 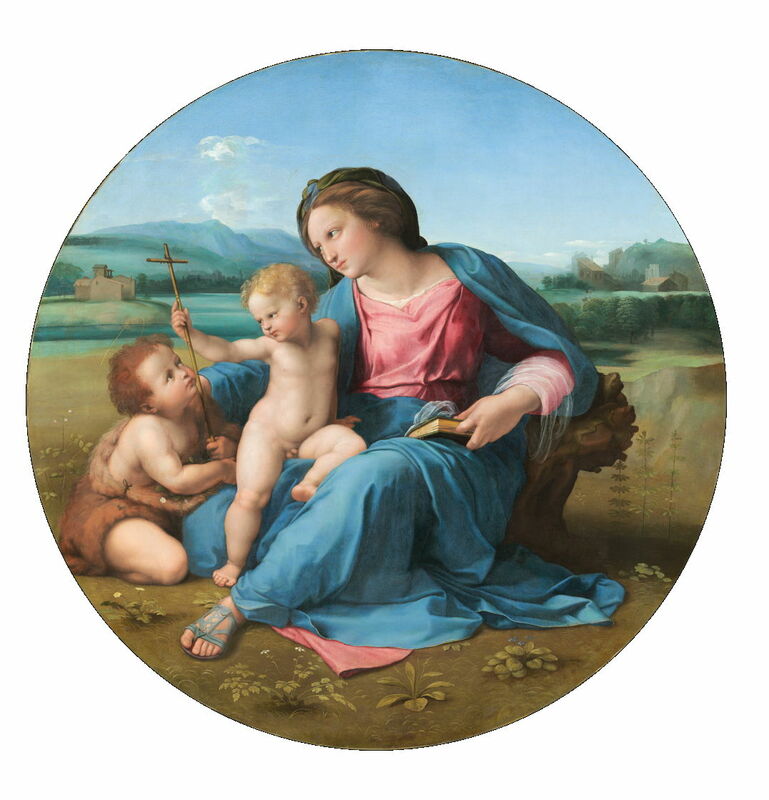 For many art historians, the fourth would have to be Fra Bartolomeo, for his innovations in clothing and its depiction, his use of real landscapes sketched in front of the motif, draughtsmanship, simple but effective compositions, and above all for his influence on the young Raphael. Today is the five hundredth anniversary of Fra Bartolomeo’s death, on 31 October 1517. There have been some small exhibitions, mainly of his drawings, to mark the occasion, but for most it will pass almost unnoticed. 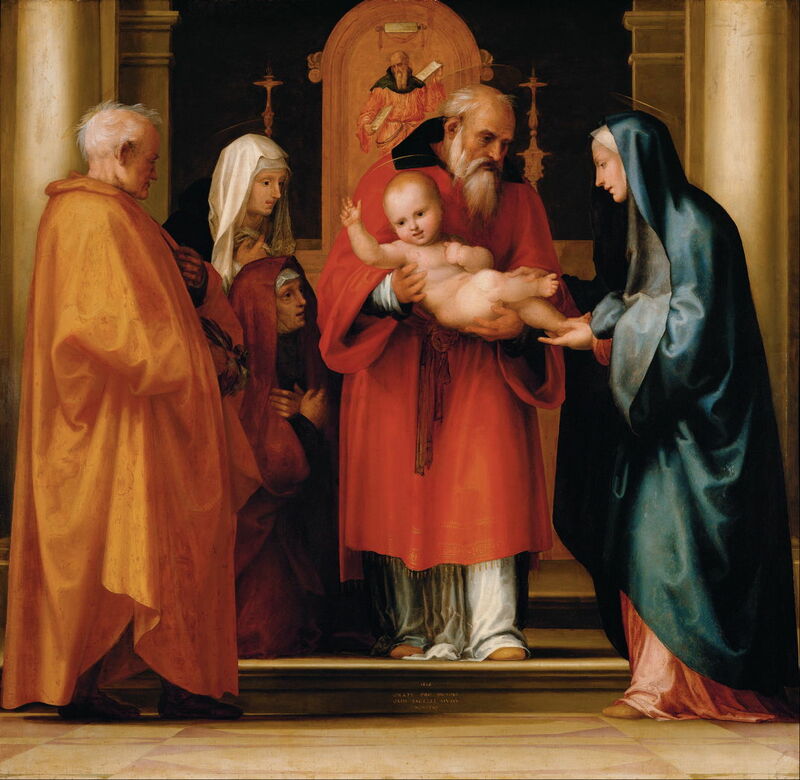 In this final article of my series looking at Fra Bartolomeo and his work, I show some of his finest paintings, including two which survived from the first part of his career, before he became a friar, alongside some of Raphael’s, over a similar period. I will, in the main, let the paintings speak for themselves, but feel that this is the best way to put Fra Bartolomeo’s work in context, with an artist who is without doubt one of the greatest of the Renaissance, and one of the most important painters in the history of European art. Raphael, born in 1483, was of course just over ten years younger than Fra Bartolomeo. Both their careers were lamentably brief: when Raphael died in 1520, he was only just 37; Fra Bartolomeo was 45 when he died in 1517, but had lost four years when he stopped painting. The two were close friends from Raphael’s arrival in Florence in 1504, which coincided with Fra Bartolomeo’s return to painting. For the next four years, when they were both in Florence, they appear to have learned much from one another. When Raphael moved on to Rome, Fra Bartolomeo periodically caught up with him still. Both seem to have benefitted from Leonardo da Vinci’s presence in Florence from 1504-06. Fra Bartolomeo, Madonna and Child with the Young Saint John the Baptist (c 1497). Note its glimpses of landscape, and the superb depiction of the Madonna’s clothing, particularly over her right forearm, and in her veil. Raphael (Rafael Sanzio de Urbino) (1483–1520), Madonna and Child with Book (Madonna Pasadena or Madonna and Child) (1504), oil on panel, 39 x 28 cm, Norton Simon Museum of Art, Pasadena, CA. Wikimedia Commons. 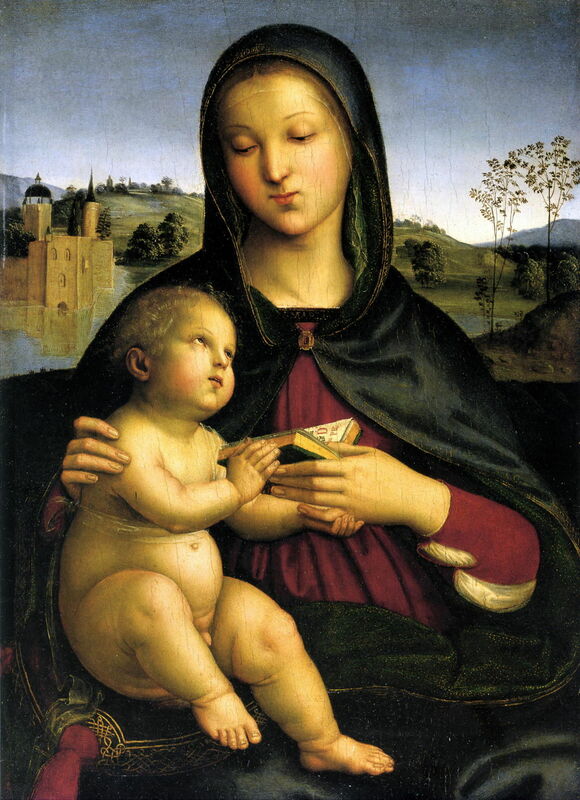 Raphael, Madonna and Child with Book (1504). 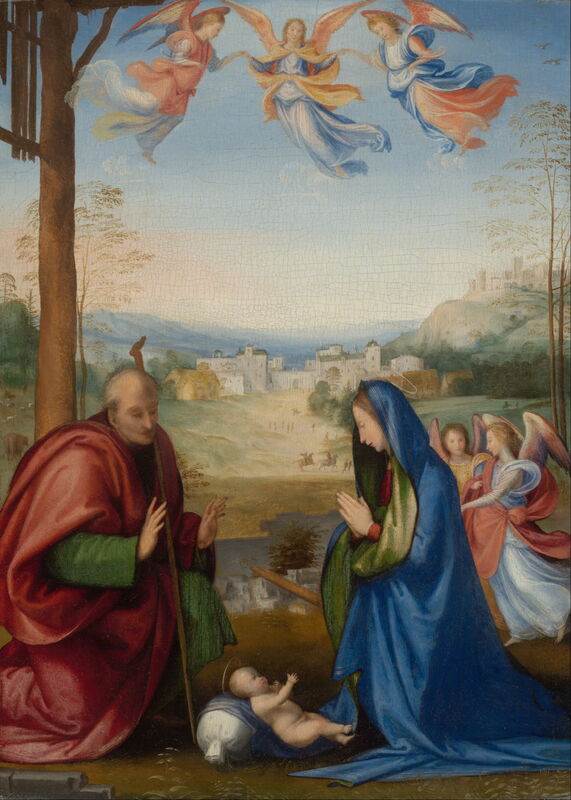 An early work, probably painted during one of his first visits to Florence. 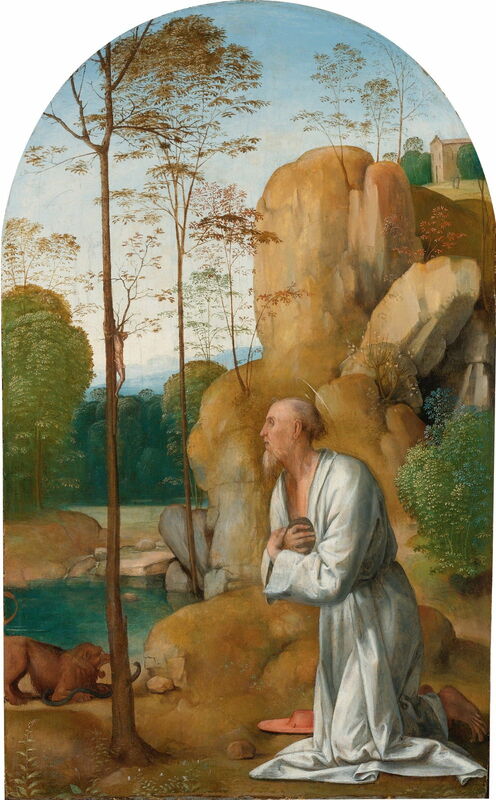 Fra Bartolomeo, Penitent Saint Jerome (1498). A sophisticated distant landscape, with a delightful crucifix worked into a tree. Raphael (Rafael Sanzio de Urbino) (1483–1520), Madonna in the Meadow (1505-06), oil on wood, 113 x 88.5 cm, Kunsthistorisches Museum, Vienna, Austria. Wikimedia Commons. 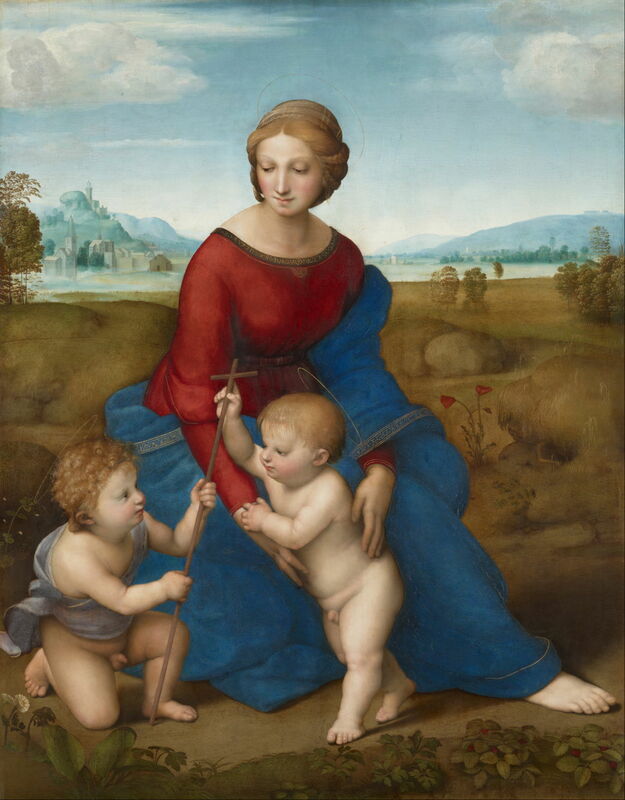 Raphael, Madonna in the Meadow (1505-06). Superb modelling of flesh, finely-painted flowers and plants, but still rather amorphous clothing. Fra Bartolomeo, The Nativity (1504-07). The landscape was developed from a sketch presumably made in front of the motif. Breaking with convention, Joseph has no beard. Raphael (Rafael Sanzio de Urbino) (1483–1520), Madonna with Beardless St Joseph (1506), tempera on canvas transferred from wood, 74 × 57 cm, Hermitage Museum Государственный Эрмитаж, Saint Petersburg, Russia. Wikimedia Commons. 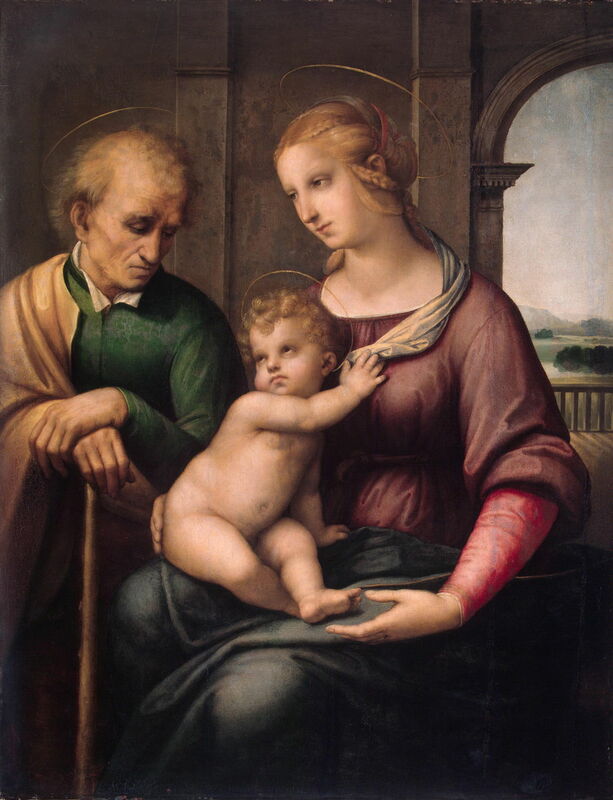 Raphael, Madonna with Beardless St Joseph (1506). Joseph has no beard, and appears to have been painted from a real model. The garments have the look of real fabrics. 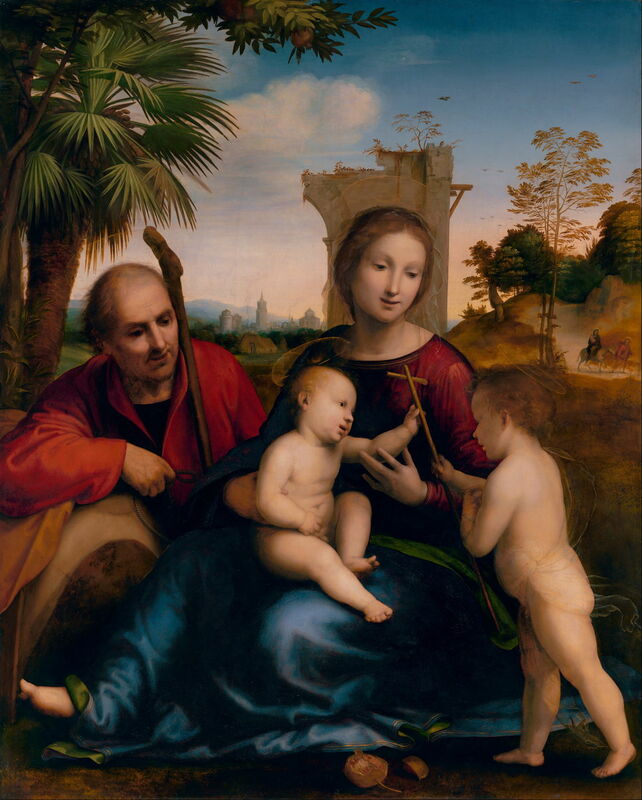 Raphael (Rafael Sanzio de Urbino) (1483–1520), The Holy Family with a Palm Tree (1506), oil and gold on canvas, transferred from panel, diameter 101.5 cm, National Gallery of Scotland, Edinburgh, Scotland. Wikimedia Commons. 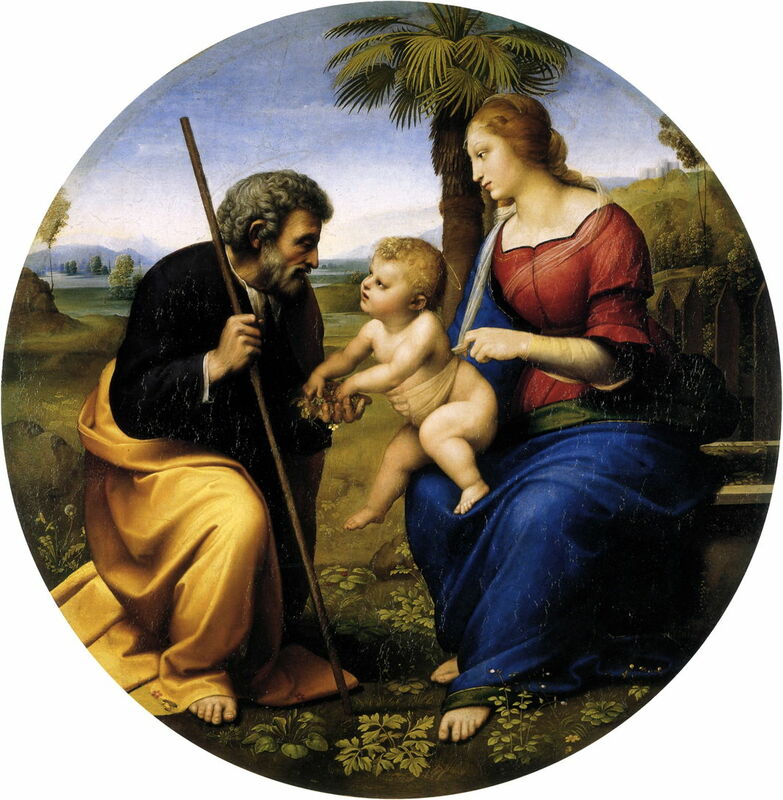 Raphael, The Holy Family with a Palm Tree (1506). A bearded Joseph again, but he appears to have been painted from a model still. Note the palm tree with its shaggy trunk. Fra Bartolomeo, The Rest on the Flight into Egypt with St. John the Baptist (c 1509). Another beardless Joseph who must have been painted from a model. The palm tree has a shaggy trunk, and the landscape background is a joy. 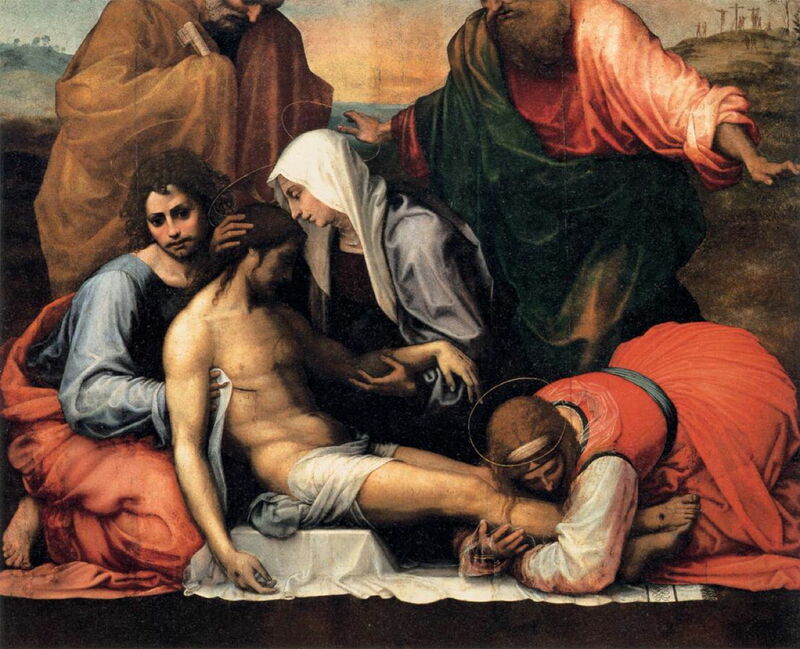 Raphael (Rafael Sanzio de Urbino) (1483–1520), The Deposition (1507), oil on panel, 184 × 176 cm, Galleria Borghese, Rome. Wikimedia Commons. 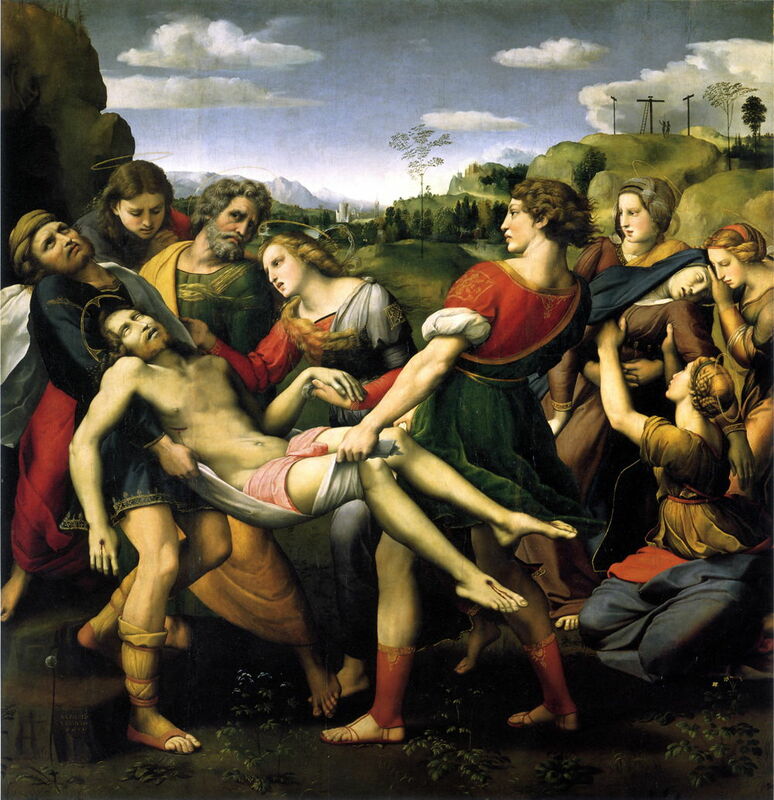 Raphael, The Deposition (1507). This composition is apparently based on drawings inspired by reliefs on Roman sarcophagi, and mixes the Deposition, Lamentation, and Entombment. Fra Bartolomeo (1472–1517), Pietà (Lamentation of Christ) (1511-12), oil on panel, 158 x 199 cm, Palazzo Pitti, Florence, Italy. Wikimedia Commons. Fra Bartolomeo, Pietà (Lamentation of Christ) (1511-12). A similar composition in many respects, which leans more towards Lamentation than Deposition. Note the almost identical placement of the crosses on Calvary at the right edge. 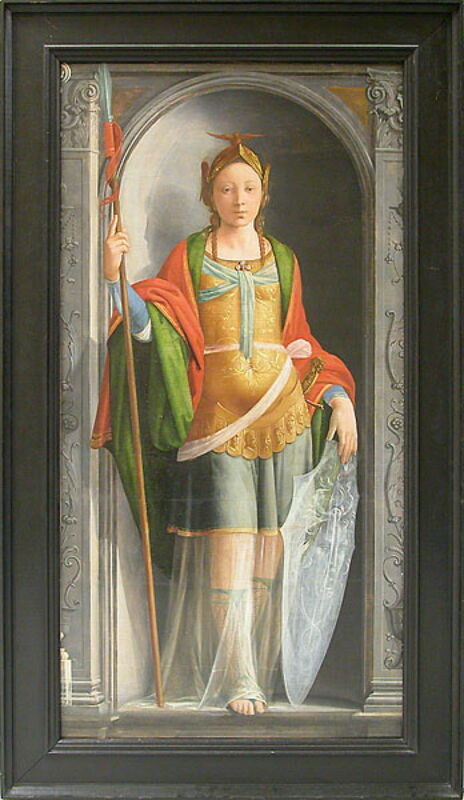 Fra Bartolomeo, Minerva (1510s). An unusual secular motif, beautifully painted. Raphael (Rafael Sanzio de Urbino) (1483–1520), The Alba Madonna (c 1510), oil on panel mounted on canvas, diameter 94.5 cm, National Gallery of Art, Washington, DC. Wikimedia Commons. 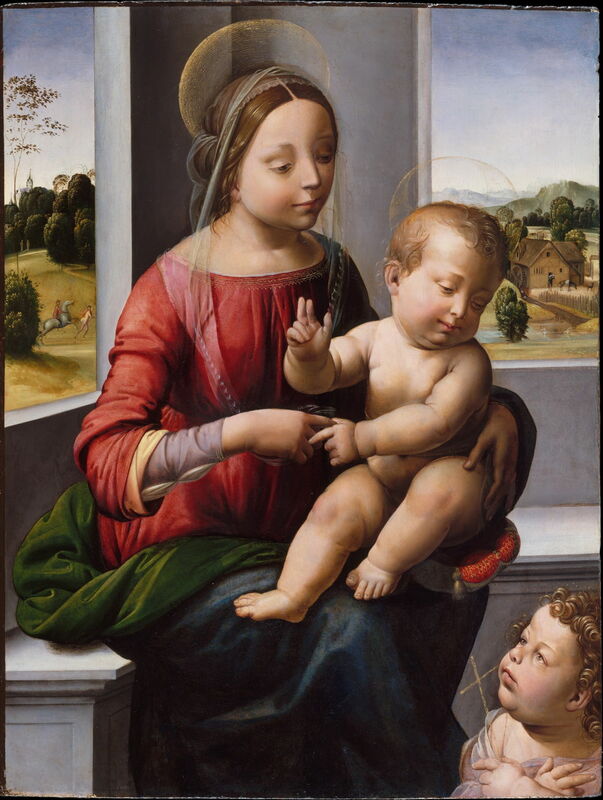 Raphael The Alba Madonna (c 1510). With its superb landscape. 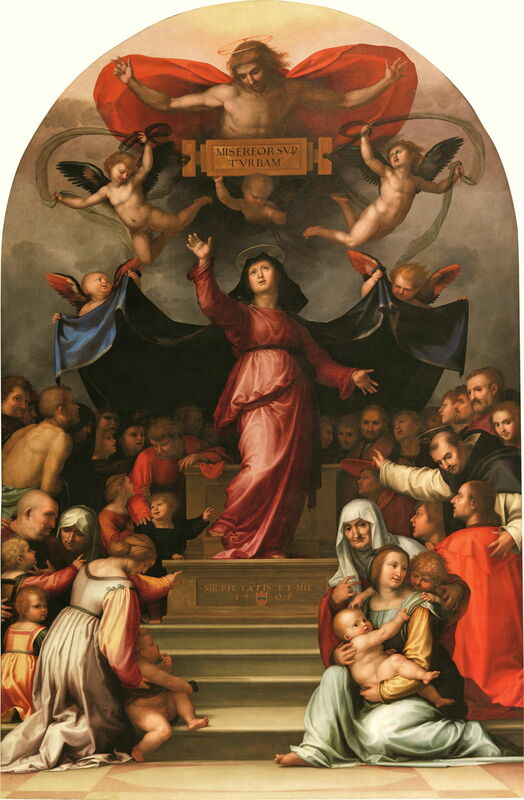 Fra Bartolomeo, Madonna della Misericordia (1515). One of his most populous works, with a rich and fascinating collection of figures, and an unusual composition. 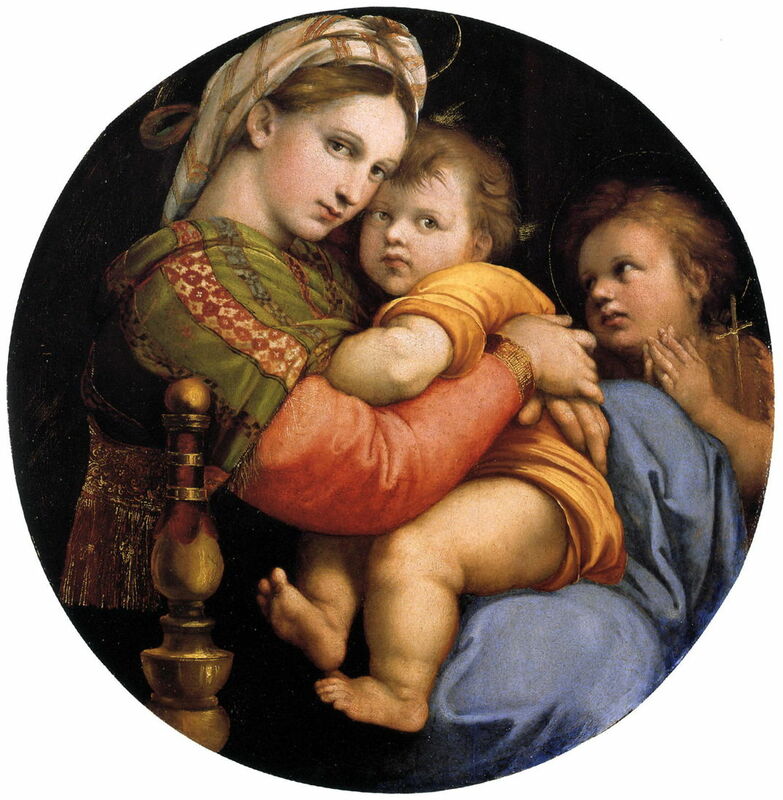 Raphael (Rafael Sanzio de Urbino) (1483–1520), Madonna della seggiola (Madonna of the Chair) (1513-14), oil on panel, diameter 71 cm, Palazzo Pitti, Florence, Italy. Wikimedia Commons. Raphael Madonna della seggiola (Madonna of the Chair) (1513-14). The faces of the Virgin and Child are superb, and all fabrics are natural in appearance, texture and ‘feel’. Fra Bartolomeo, The Scene of Christ in the Temple (1516). A very natural-looking group. Which brings me to a final question: what was it that the Pre-Raphaelites objected to? Posted in General, Painting and tagged Bartolomeo, Bartolommeo, da Vinci, Fra Bartolomeo, landscape, painting, Raphael, renaissance. Bookmark the permalink.